Big Sandy & His Fly-Rite Boys is a western swing/country boogie musical band from California. The band is composed of Robert Williams, alias Big Sandy, Ashley Kingman, Ricky McCann and Kevin Stewart. 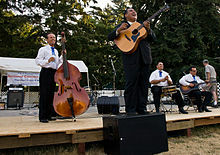 They began as rockabilly revivalists in the late 1980s, then dug deeper into the music which rockabilly came from: western swing and particularly the country boogie style of the late 1940s and early 1950s, which served as a link of sorts between the western swing and rockabilly eras and was particularly associated with California country music in that era. Former members include Joe Perez, Jeff West, Bobby Trimble, TK Smith, Carl Leyland, Lee Jeffriess, and Wally Hersom. The band has been inducted into the Rockabilly Hall of Fame. ^ Miller, Jay N. (19 November 2015). "MUSIC SCENE: Big Sandy and His Fly-Rite Boys swing into Fall River". The Patriot Ledger. Retrieved 18 January 2018. ^ Harris, Craig. "Biography: Big Sandy & His Fly-Rite Boys". Allmusic. Retrieved 26 April 2010. This page was last edited on 25 January 2018, at 03:36 (UTC).